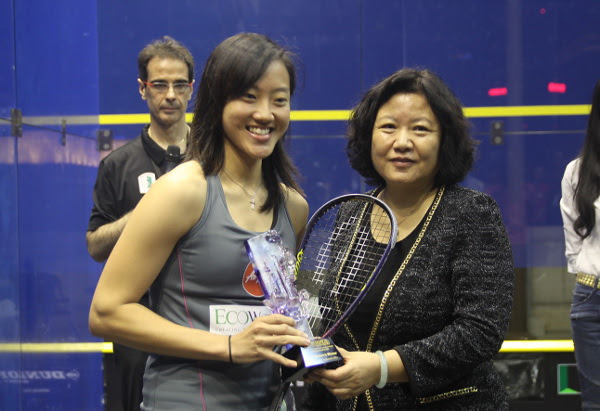 Low Wee Wern maintained Malaysian ownership of the Women’s China Open – Squash Stars On The Bund title for the fourth year in a row, and claimed the title for herself a third time when she upset top seed Camille Serme in the final of the WSA Gold 50 event in Shanghai. It was a marathon climax to the biggest ever Tour event staged in mainland China – the action taking place on an all-glass showcourt on the 11th floor of The Peninsula Hotel overlooking the spectacular Shanghai skyline on the city’s famous Bund waterfront. Third seed Low, the world No7 from Penang, took a two-game lead in the final before French number one Serme, ranked five in the world, reclaimed the initiative to draw level. “It seemed now that the momentum might be with Serme,” reported respected English coach Malcolm Willstrop. “But oddly enough it was Low who led 3-0, and later 7-3 before the tenacious Serme hit back after Low had taken a blow in the face at 7-5. Low clinched her 11-8, 11-6, 8-11, 8-11, 12-10 victory in 102 minutes – marking the 24-year-old’s longest ever match win on the WSA World Tour! The triumph marked the seventh WSA Tour title of Low’s career – but her first since being struck down with Dengue fever in July. “I’m absolutely delighted to win the China Open,” said the jubilant Malaysian, also winner of the title in 2011 and 2012. “It’s been a great week for me. “This year hasn’t been great – I lost my dad earlier this year when I was competing in Chicago, down with Dengue and all.